Here are updates through the day, night & into Sunday. Reports vary from 3-7" along & north of a Pine Village to Kokomo line at the moment. It is 3" or less south of there from the reports I have received so far. In the far southeast only 1" has been reported. Ice accumulations of up to 0.15" have been reported in the southeast. Snow is falling from near Grissom ARB to Stockwell southwestward to southern Fountain County. This area of snow is moving northeastward. Along the edge & south of this zone, 0.5-3" is possible. North of that, localized 1" or less fluffy snowfall amounts are possible tonight-tomorrow from lake effect snow flurries & snow showers. Winds are strong with lots of blowing & drifting around the area. Widespread 35-40 mph gusts are likely a few 40-50 mph are possible over the next few hours. Local ground blizzard conditions in open areas are likely. *These seem to be stuck or clogged from ice, compromising data. 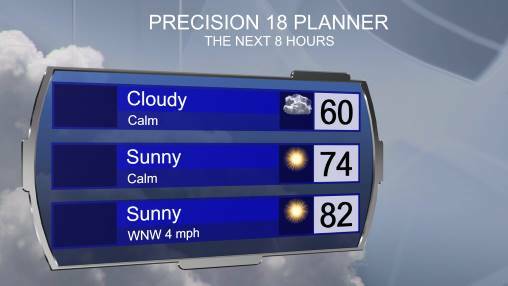 Make sure to tune in for Meteorologist Balint Szalavari's forecast this evening & tonight on News 18. He will break down tonight to the next 7 days with the latest data. Snow has thinned out to flurries & light snow over the area, but blowing & drifting is widespread. Totals vary from 1" in the far southeast to 6". Total west of West Lafayette is holding at 4" with steady very light snow for the past 1.5 hours. New snow is south of I-74 down toward Terre Haute & working northeastward, so we are not finished with accumulating snowfall yet. Seems this is just like the last storm where we saw a bit of a break in the snowfall for a bit. Looks like peak gusts may accompany this snow, resulting in worsening conditions for the evening. Current gusts are running 20-31 mph, but gusts of up to 46 mph have been measure around Champaign & Decatur, Illinois. That wind is working northeastward. Ground blizzard conditions are possible for a while this evening. Gusts of 40-50 mph in parts of the area are still possible with at least 35-40 mph for the entire viewing area. A few isolated power outages are possible, largely in areas that have the 0.1" of ice accumulation in the south & far southeast. Temperature are running 23-28 over area & slowly falling. Temperatures continue to drop with snow line working southeastward. Temperatures range from 24-29. Snow is over about 80% of the area, but freezing rain & sleet are lingering in the southeast with icing of up to 0.1" reported. Winds are gusting 25-35 mph with sustained winds 15-25 mph. Peak wind gusts should be late afternoon-evening (35-40 mph area-wide, but some pockets of 40-50 mph cannot be ruled out). Areas that have the greatest ice accumulation on trees in the south & southeast may see some limbs break with these gusts. A few power outages cannot be ruled out there. Elsewhere, the power outage risk is less, but not zero. In areas with much of the snow, widespread blowing & drifting continues with significant reductions in visibility. This aspect will worsen as the wind peak. I have measured 4.0" west of West Lafayette as of 2:15 p.m. Totals in Tippecanoe County range from less than 1" in the far southeast to 5.5" in the north. Snowfall totals in the area range from overall 3-6" in the northern & northwest half to less than 1" in parts of the southeast. Latest data suggests an additional 1-4" over the area through tonight. 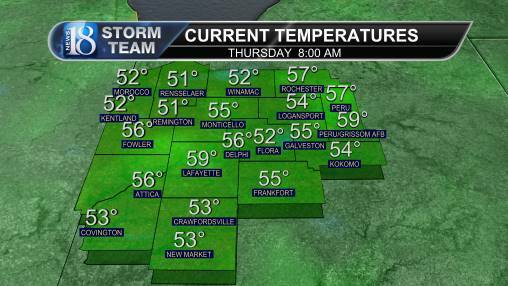 Temperatures are now falling over a good chunk of the area. I have dropped from 30 to 27 since 9:30 a.m. Temperatures are cooling aloft northwest to southeast, meaning that areas that are receiving icy mix will go to all snow soon. Temperatures vary from 24-25 in the northwest to 31 in the southeast. The snow will become increasingly dry & fluffy, resulting in even higher tendency to drift. Given this, with increasing wind gusts, will result in greater blowing & drifting & visibility issues. Moderate to heavy snow continues at this observation point at West Lafayette with 3.0" measured as of 12 p.m. Totals very from 2-5" over the northern & northwestern half to as little as 1" or less in the south & southeastern where much of the precipitation has been sleet & freezing rain. Kentland has had 3", Battle Ground reports 5", southwest of West Lafayette, 3" has been measured. 3" has been reported from Galveston & Logansport. Fowler, Round Grove, Brookston, Buck Creek, Delphi, Camden all report 3-5". Morocco & Lake Village are reporting 3". I have received reports of Indiana 39, 43 & 18 drifted over with some cars getting stuck as blowing & drifting snow occurs. Current wind gusts are running 21-32 mph over the viewing area. Highest gusts are running from Morocco, Rensselaer, Fowler & Remington, through the Lafayette area at 28-32 mph. However, a gust of 28 mph was just measured at the Kokomo Municipal Airport & a gust of 30 mph was just measured at Galveston. Winds are sustained at 15-25 mph area-wide. Blowing & drifting are in progress & it is already becoming difficult to measure as a result. I measured 1.3" of snow on the board at West Lafayette. Freezing rain & sleet are occurring in Fountain, Montgomery & Clinton counties. Current wind gusts (from the northeast) are 22-32 mph. Highest gusts of 27-32 mph are at West Lafayette, Frankfort, Fowler & at I-65/US 24 Remington INDOT station & Morocco. 2-4" has already been reported from Newton & Jasper counties (totals were 1-2.5" already at 7 a.m. there this morning). 1-3" has been reported from the rest of the area with around 1" or less in the south & southeast. 4-8" snow expected over the viewing area. There will likely be a few places that are just below 4" & a few that just exceed 8" slightly. Wind & the blowing & drifting will be the biggest thing you notice with this storm.